How would you like a one-of-a-kind piece of art, that is dog art, custom made of your Miniature Schnauzer? Or maybe you're looking to buy a gift for a dog-loving friend and want something that will be very special and personal to them? A gift they will surely cherish forever! 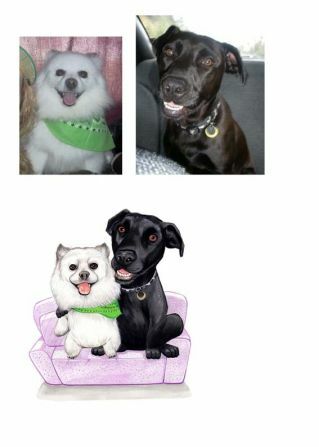 A pet portrait, dog painting, dog print, or an adorable pet caricature is the perfect gift for a true Schnauzer lover. 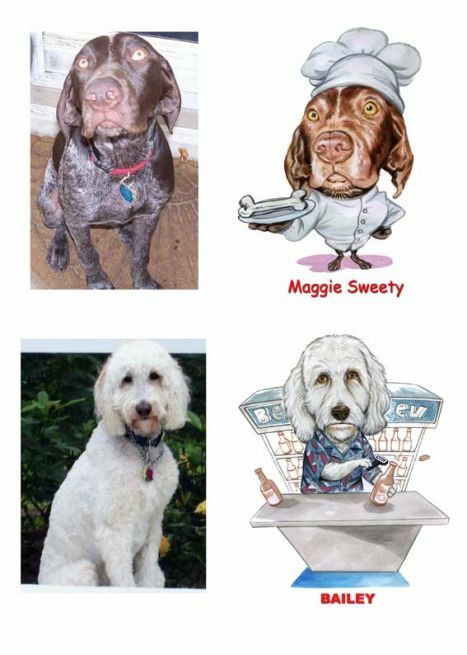 Because they are custom drawn, these dog caricatures will capture the sweet, funny personality of your Miniature Schnauzer in a fun, realistic, true piece of artwork. 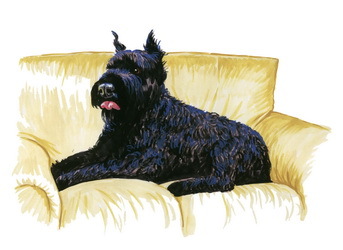 And while there are plenty of cartoon images of Miniature Schnauzers, that might even be very similar to your dog... nothing beats owning an exact caricature drawing. One that is done using an image of your Miniature Schnauzer. And because they're super affordable, it's silly not to get one. Want to know more about how it's done? All you have to do is send in your favorite photo of your Miniature Schnauzer, explaining how you want your Schnauzer's caricature to look like. Do you want your Schnauzer sitting in a field, chasing a squirrel, or posing as a chef? Your choice is only limited by your imagination. I had one made from a photo taken of me and my Schnauzer together. And I absolutely love it! Plus I can have my image put on all kinds of products that I want to personalize. Next, you choose what type of exaggeration you prefer. There are 3 choices: No exaggeration, a little exaggeration, or over exaggeration. After you've made your decisions, skillful artists go to work creating your very own custom-drawn Miniature Schnauzer caricature. It is truly a work of art ~ Schnauzer dog art! 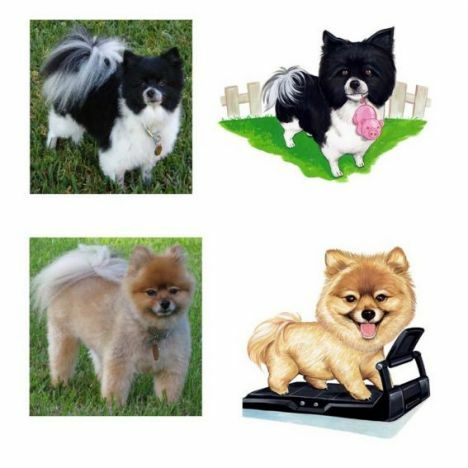 The quality of you custom pet drawing is guaranteed and did I mention it’s very affordable! PLUS there's a shop for you to put your Miniature Schnauzer caricature image on all kinds of things like: T-shirts, Calendars, Mugs, Posters, Stickers, Greeting Cards, and more! 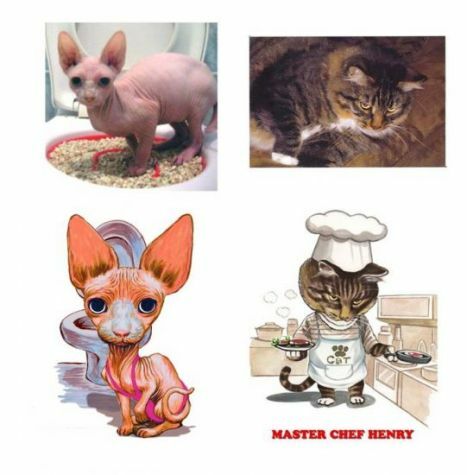 Click here to find out more about these affordable pet caricatures! 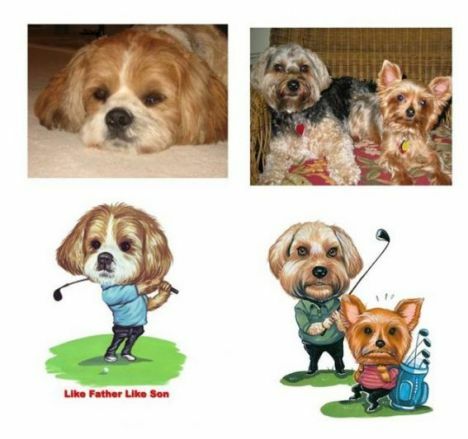 I love my Miniature Schnauzer caricature and I know your personalized dog caricature will be a wonderful keepsake you will forever cherish forever, too. 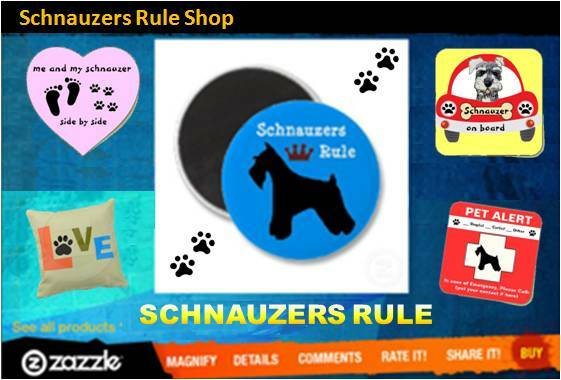 note: We would love for you to share your Miniature Schnauzer's caricature on this website. If you would be willing to do so, please contact us. 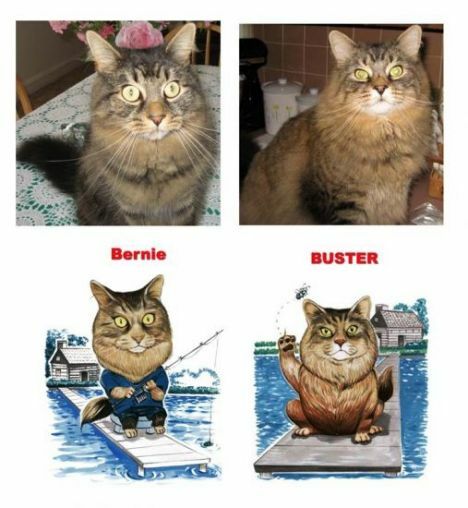 Check out these wonderful before and after pet caricature examples. They do custom artwork for kitty cats, too!